Larry Macon holds The Guinness World Record For The most Marathons Run in a single year. The validity of the record does not hold up to scrutiny. This is a refresh of an article originally posted on May 24, 2016. Information from multiple articles have been combined. Larry Macon was sitting in a coffee shop in San Antonio with some of his fellow trial lawyers one Monday afternoon in 1996 when they started swapping tales of their weekend exploits. Some bragged about their golf games. Others about swimming or biking long distances. When the conversation swung around to Macon, he chose fiction. From there Larry became addicted to marathon running, the obsession began to take on a new level with the pursuit of marathon records. The jump in marathons is almost entirely attributable to the I Ran Marathons races. As seen in the image below, he did collect quite a few I Ran Marathons medals. He also ran 72 races in California. Most of them were at Charlie Alewine races. Below is an excerpt from the ESPN article – dated January 15, 2014. According to his results (available here) Larry was sold short. According to these results, he completed 6 marathons Friday-Sunday August 16th – 18th 2013. In my opinion, had Larry managed to run 6 marathons in a weekend in 2013, he certainly wouldn’t have shortchanged this accomplishment when relaying his story to the ESPN reporter. I pulled the above claimed results from Marathon Maniacs results. The marathon totals shown on the Maniacs page corresponds precisely with his Guinness record. Even if Larry was very resourceful with early/late starts, the schedule above would be logistically impossible – not to mention the physical toll. According to the above, he ran marathons in San Antonio and Huntington Beach on Friday (both races officially start early morning). He then ran 2 marathons in California on Saturday in a combined time of over 16 hours, and then traveled to Nevada for a midnight start in the E.T Marathon. Following the E.T. Marathon, he made it back to California for one last marathon. I cannot come up with a scenario – even given the most liberal of early or late starts where this schedule was even remotely possible. 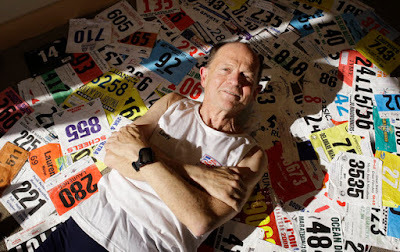 During his current Guinness World Record window, there were a total of 38 instances where Larry logged 2 marathons on the same day. Here are just a few examples. Many of the other instances involved an I Ran Marathon and a Charlie Alewine Marathon on the same day. (Larry) was allowed to “early start” before she (Parvaneh) arrived and was on an honor system to report his time and laps. Ken did believe that Larry likely completed the marathon distance each of the 3 days he ran the “I Ran” races. 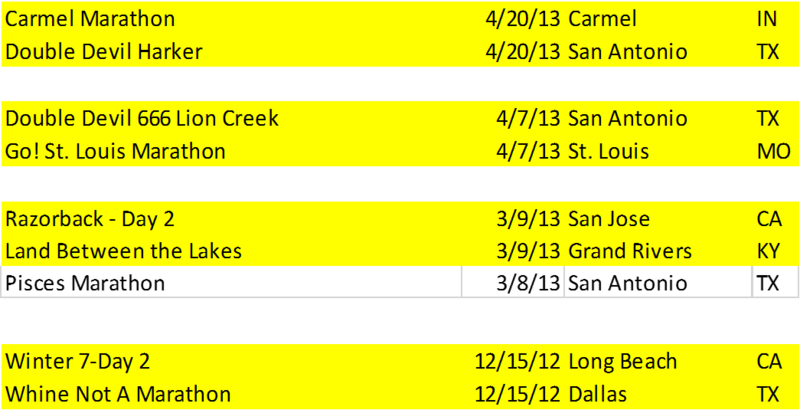 I provided just a sampling of Larry’s races and seemingly impossible schedule during his World Record marathons. I know I will once again hear from some supporters of Larry’s that have seen him or run with him during marathons. I am not questioning that Larry legitimately completes a ridiculous amount of marathons. If you saw him at a legitimate race, I’m sure he walked/ran every step of the way. What I am trying to shine a light on is His record of most marathons in one year, and by extension his claim of 2000+ total marathons. This 239 marathons in a single year is a record that is impossible to beat. There are criteria for what makes a race official. If you take the I Ran Marathons out of consideration, there are simply not enough official Marathons in a year for anyone to be able to approach the record. It is beyond me how Guinness continues to recognize his record (and Parvaneh’s record). Even after multiple attempts, Guinness has failed to investigate the results. This is a disservice to runners who may want a legitimate shot at these records, and unfairly calls legitimate record holders into question. If you’ve read all this and still want more, I did post a follow up in June 2016 with some additional information regarding Parvaneh and Larry. 100% impossible! 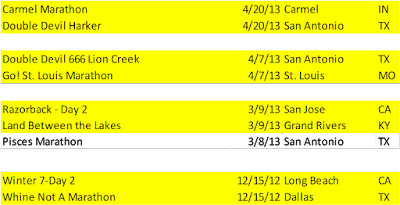 I believe to even achieve such a legit record, it has to be a sanctioned, official USATF marathon. Those casual marathons thrown by small running groups or RDs trying to raise money for local charity, are usually just for fun and if you BQ in those, they will not work because they are not USATF/measured courses. Who’s to say he cheated the distance to make the flight from San Antonio to Cali; even if the flight is only 2 hours, add 2 hours for airport/travel time. There’s not enough hours in a day to walk multiple marathons in multiple states in the same day. And I call BS to such a record if you are not actually running them. I’ll leave it up to Guinness and the the race directors as to whether they give him the record and official results. In my book he did not run XYZ race, he ran the XYX course if he came in at midnight and finished his run before anyone else even started. Or after the course officially closed. It’s an amazing accomplishment and I could never do it, but it’s very contrived. I guess he has no online stats for all his marathon running, looks like a GPS watch in the photo. Seems the more one cries foul the more guilty one is. Nick Nicholson has just smashed Larry’s cheating record but has done it for real .